Fusarium yellows of sugarbeet was identified in the Red River Valley in a few fields between Moorhead, Minn., and Drayton, N.D., in 2002. Fusarium yellows is caused by the fungus Fusarium oxysporum f. sp. betae, although other Fusarium species can be involved as secondary invaders. The disease causes significant reduction in root yield and recoverable sucrose. In storage, the quality of infected roots may deteriorate more rapidly than in noninfected roots. Fusarium yellows of sugarbeet was identified in the Red River Valley in a few fields between Moorhead, Minn., and Drayton, N.D., in 2002. Fusarium yellows is caused by the fungus Fusarium oxysporum f. sp. betae, although other Fusarium species can be involved as secondary invaders. The disease causes significant reduction in root yield and recoverable sucrose. In storage, the quality of infected roots may deteriorate more rapidly than in noninfected roots. Fusarium yellows first appears on older leaves as chlorosis (yellowing) between the larger veins. As the disease progresses, younger leaves also become chlorotic, and the older, symptomatic leaves become necrotic (Figure 1). 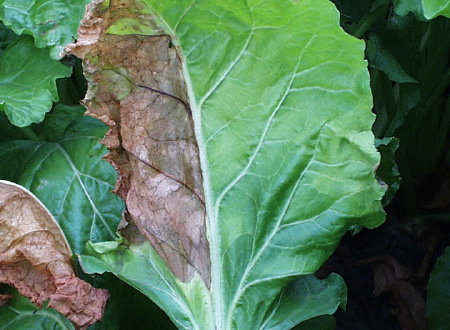 Occasionally, only half a leaf is chlorotic or necrotic (Figure 2) (a symptom more typical of Verticillium wilt, which also was identified recently on sugar beet in this region). Figure 1. Lower, older leaves become yellow between the larger veins and eventually die but remain attached to the plant. Figure 2. Some plants infected with Fusarium may have half a leaf with necrosis. In the early stages of the disease, foliage tends to wilt during the day but recovers overnight. Entire leaves eventually die but remain attached to the plant and collapse in a heap around the crown. This disease has no external root symptoms. A transverse section through the root shows a grayish-brown vascular discoloration (Figures 3-5). Mature plants rarely die, but yield is reduced. Figure 3. This infected root has grayish-brown to black discoloration of vascular bundles. Figure 4. 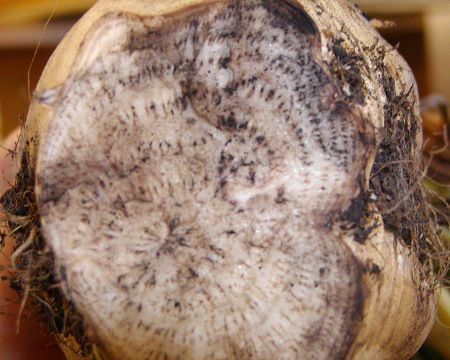 The outer surface of an infected root shows no symptoms. A transverse section through the root shows grayish-brown to black discoloration. Figure 5. This shows the disintegration of cells in the vascular tissue in an advanced stage of the disease. Fusarium oxysporum f. sp. betae survives in soil and plant residues as spores, chlamydospores or mycelium. 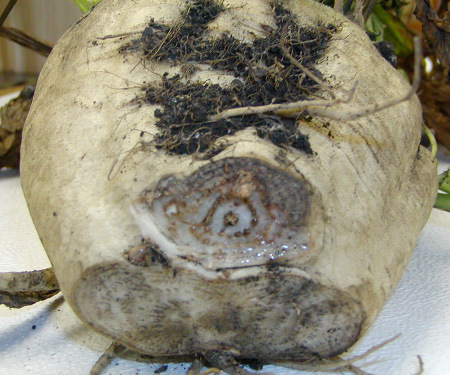 When conditions are favorable, the fungus enters sugar beet roots and invades the vascular system, where it produces toxins that are transported upward in the plant, causing foliar symptoms. The fungus also acts as a “plug” that clogs the vascular tissue and, subsequently, causes wilting. The disease is favored by high soil temperatures — above 75 F. Symptoms typically do not appear early in the growing season. Fields that are waterlogged or have poor soil structure provide favorable conditions for infection. The fungus survives in soil for many years. 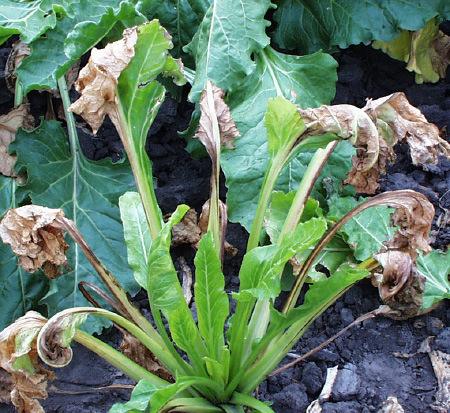 Nematode infection often will increase the severity of Fusarium wilt. 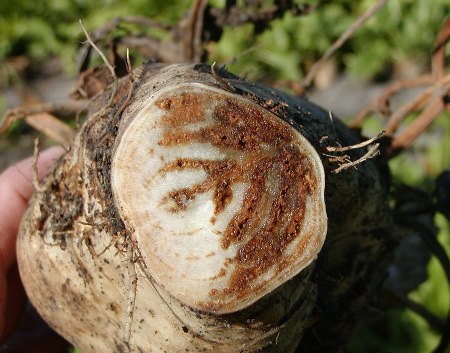 Fortunately, nematodes have not been identified on sugar beet grown in Minnesota and eastern North Dakota. 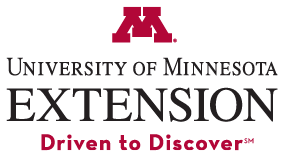 Crop rotation may reduce inoculum buildup in the soil, but this practice is unreliable because F. oxysporum f. sp. betae has a wide host range and chlamydospores survive for many years. Movement of infested soil on contaminated field equipment should be avoided to prevent its spread to noninfested fields. No fungicide that provides effective disease control is available. Growers who have fields with a history of the disease should plant Fusarium yellows-resistant varieties. Figures provided by C. A. Bradley, M. F. R. Khan, and R. Nelson. Duffus, J. E. and Ruppel, E. G. 1993. Diseases. Pages 346-427 In: The sugar beet crop. D. A. Cooke and R. K. Scott (Eds.) Chapman and Hall, London. Franc, G. D., Harveson, R. M., Kerr, E. D. and Jacobsen, B. J. 2001. Disease management. Page 131-160 In: Sugarbeet Production Guide. Univ. Nebraska Coop. Extension EC01-156. Schneider, C. L. and Whitney, E. D. 1986. Fusarium Yellows. Page 18 In: Compendium of Beet Diseases and Insects. E. D. Whitney and J. E. Duffus (Eds.). APS Press, St. Paul, MN.